April 21, 2011 - NLRB Acting General Counsel Lafe Solomon on Wednesday issued a complaint against the Boeing Company for alleging that it violated federal labor law by deciding to transfer a second production line to a non-union facility in South Carolina for discriminatory reasons. Boeing announced in 2007 that it planned to assemble seven 787 Dreamliner airplanes per month in the Puget Sound area of Washington state, where its employees have long been represented by the International Association of Machinists and Aerospace Workers. The company later said that it would create a second production line to assemble an additional three planes a month to address a growing backlog of orders. In October 2009, Boeing announced that it would locate that second line at the non-union facility. In repeated statements to employees and the media, company executives cited the unionized employees? past strike activity and the possibility of strikes occurring sometime in the future as the overriding factors in deciding to locate the second line in the non-union facility. The NLRB launched an investigation of the transfer of second line work in response to charges filed by the Machinists union and found reasonable cause to believe that Boeing had violated two sections of the National Labor Relations Act because its statements were coercive to employees and its actions were motivated by a desire to retaliate for past strikes and chill future strike activity. ?A worker's right to strike is a fundamental right guaranteed by the National Labor Relations Act,? Mr. Solomon said. ?We also recognize the rights of employers to make business decisions based on their economic interests, but they must do so within the law. I have worked with the parties to encourage settlement in the hope of avoiding costly litigation, and my door remains open to that possibility.? To remedy the alleged unfair labor practices, the Acting General Counsel seeks an order that would require Boeing to maintain the second production line in Washington state. The complaint does not seek closure of the South Carolina facility, nor does it prohibit Boeing from assembling planes there. 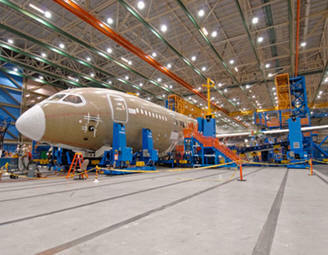 On March 26, 2010, the International Association of Machinists and Aerospace Workers, District Lodge 751, filed a charge with the NLRB alleging that the Boeing Company had engaged in multiple unfair labor practices related to its decision to place a second production line for the 787 Dreamliner airplane in a non-union facility. Specifically, the union charged that the decision to transfer the line was made to retaliate against union employees for participating in past strikes and to chill future strike activity, which is protected under the National Labor Relations Act. The union also charged that the company violated the National Labor Relations Act by failing to negotiate over the decision to transfer the production line. The Machinists? union has represented Boeing Company employees in the Puget Sound area of Washington, where the planes are assembled, since 1936, and in Portland, Oregon, where some airplane parts are made, since 1975. Throughout the investigation of the charge, NLRB officials met with both parties in efforts to facilitate a settlement agreement. The overwhelming majority of NLRB charges found to have merit are settled by agreement. Although no settlement was reached and the Agency was compelled to pursue litigation, the Acting General Counsel remains open to a resolution between the parties. The complaint (19-CA-32431) alleges that Boeing violated two sections of the National Labor Relations Act by making coercive statements and threats to employees for engaging in statutorily protected activities, and by deciding to place the second line at a non-union facility, and establish a parts supply program nearby, in retaliation for past strike activity and to chill future strike activity by its union employees. The investigation found that Boeing officials communicated the unlawful motivation in multiple statements to employees and the media. For example, a senior Boeing official said in a videotaped interview with the Seattle Times newspaper: "The overriding factor (in transferring the line) was not the business climate. And it was not the wages we?re paying today. It was that we cannot afford to have a work stoppage, you know, every three years." Boeing said it will vigorously contest a complaint brought before the National Labor Relations Board (NLRB) today by the leadership of the International Association of Machinists and Aerospace Workers (IAM). "This claim is legally frivolous and represents a radical departure from both NLRB and Supreme Court precedent," said Boeing Executive Vice President and General Counsel J. Michael Luttig. "Boeing has every right under both federal law and its collective bargaining agreement to build additional U.S. production capacity outside of the Puget Sound region." Luttig said Boeing was confident that the claim would be rejected by the federal courts. He also emphasized that the company will begin assembling 787s in South Carolina this summer, as planned. "We fully expect to complete our new state-of-the-art facility in South Carolina in the weeks ahead, and we will be producing 787s ? America's next great export ? from our factories in both Puget Sound and South Carolina for decades to come," he said. The complaint also alleges that Boeing?s actions were ?inherently destructive of the rights guaranteed employees by Section 7 of the Act." Absent a settlement between the parties, the next step in the process will be a hearing before an NLRB administrative law judge in Seattle, set for June 14, at which time both parties will have an opportunity to present evidence and arguments. Bell Helicopter Honors "Heroes of Aviation"
Kentucky, Sale Of Two State Aircraft ?Smart Government Initiative?